Is evangelicalism a political movement? Today I want to consider “Hobby Lobby Evangelicalism.” This term isn’t meant to apply to all evangelicals at all times (see my above-mentioned “Evangelicalism is an Imagined Religious Community”), but I think it can help us understand a representative subset of those who self-identify as evangelicals today. And I think it can help us examine the role of politics in the larger evangelical movement. There has been a good deal of discussion about whether self-identification has any merit when it comes to defining American evangelicalism. Some evangelicals themselves lament that the term has been so politicized that it no longer reflects “true evangelicalism.” But if we look at Hobby Lobby Evangelicalism, it becomes clear that, for many evangelicals, religious belief and politics are so inextricably intertwined that it would be foolish to attempt to artificially separate the two in an effort to distill a “true,” untainted evangelicalism. George Marsden once defined evangelicalism as “anyone who likes Billy Graham.” I’ve always liked that definition, since it gets at the idea of evangelical identity. A few years back, I toyed with updating that definition to “anyone who shops at a Christian bookstore.” It seemed to me that American evangelicalism was as much a consumer culture as it was a group of people who ascribed to a certain set of beliefs. If evangelicalism today is as much an identity as a theology, I think it makes sense to pay attention to how consumption constructs that identity. Which brings me to Hobby Lobby. By now most brick-and-mortar Christian bookstores have gone the way of the local Blockbuster, but that hasn’t put a damper on evangelicals’ religious consumption. There are still online bookstores like LifeWay that wield enormous clout in the evangelical marketplace. But with Hobby Lobby we’ve also entered the era of big-box-store Christian consumption. Hobby Lobby, of course, has been in the news quite a bit in recent years. They helped spearhead legal opposition to the Affordable Care Act’s contraceptive mandate, and recently the Green family opened the Museum of the Bible in Washington, D.C. As Candida Moss and Joel Baden tell in their recent book Bible Nation: The United States of Hobby Lobby, the Green family has always run Hobby Lobby as a Christian business, and as a tool for evangelism. They’ve donated millions to charitable Christian causes, preferring evangelistic outreach to more mundane charitable efforts. In other words, long before the Green family embraced blatant political activism, there was much for evangelicals to love. What’s often missed in news coverage of the Green family’s activist agenda, however, is the fact that the store itself is much more than a “craft supply store.” It is a marketplace of evangelical material culture, a place where evangelical men and (mostly) women find their values reflected and reinforced in the products they purchase. Last Saturday I stopped by my local Hobby Lobby. I don’t often shop there, but my daughters and I were on a mission. We needed to buy a small glass jar with a cork stopper, a bottle that could serve as a Harry Potter potions prop. My daughter knew they were in stock at Hobby Lobby, so off we went. Once inside, book displays made the evangelical affiliation explicit. Devotionals, Christian romance novels, books by Max Lucado, Lysa TerKeurst, Joyce Meyer, Sarah Young, Lee Strobel, Franklin Graham, and Chip and Joanna Gaines lined the shelves, as did several books written by members of the Green family themselves—books about the Bible, America, and the Bible in America. Another display contained an impressive array of ESV and NIV Bibles, including Bibles for kids, an “Every Man’s Bible,” a Bible for teen girls, and “My Creative Bible,” presumably for women who like to do crafts. Clearly this was not a space where consumers needed to leave their beliefs at the door. At this point my youngest daughter drew me over to shelves of colorful little big-eyed, overpriced stuffed animals that she unfailingly finds irresistible. Nothing unusual here—Ty animals’ natural habitat seems to be near the checkouts of just about every store kids frequent. What was different here was that Hobby Lobby’s population resided under a large, red-and-green sign advertising the animals as “great for Shoebox gifts.” Anyone who has spent any amount of time in an evangelical community knows that this is referring to Franklin Graham’s Samaritan’s Purse Operation Christmas Child charity. The charity is a Rorschach test of sorts. Depending on who you ask, it’s a wonderful way for American Christian kids to give generously to less fortunate kids all over the world, brightening their day with a shoebox filled with toys, toothpaste, soap, religious tracts, and the like. 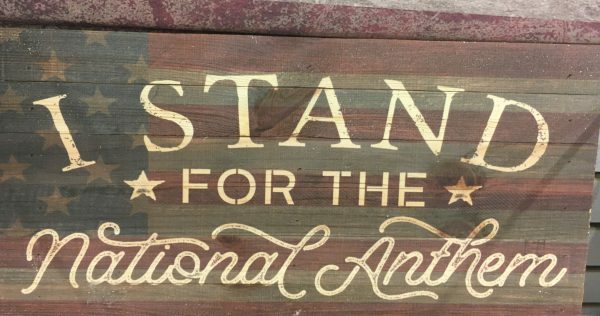 (Disclaimer: As a teenage I spent my own hard-earned dollars to buy little trinkets, packed them into boxes and sent them off with a donation as an act of genuine Christian love; in fact, I think I even organized a Shoebox collection at my Christian college.) Or, it’s a “toxic charity.” Standing there in front of the display it wasn’t hard to take the cynical view. Here was a Christian business selling over-priced products for privileged Christians to pack into shoeboxes to feel good about themselves while sending boxes crammed with dubious offerings all over the globe and padding the pockets of Franklin Graham’s not unproblematic ministry. The perfect circle. But we were on a mission. In pursuit of the glass potions bottle, my daughters and I started to make our way to the back of the store. I was soon distracted, however, by numerous displays of fake farm merchandise. I’m a small-town girl myself, and I come from a family of dairy farmers, so I’m not against a little Holstein cow décor, in moderation. And, of course, this was merely décor—products offering the illusion of the country, all the charm with none of the manure. I wondered how many of the antique-ish milk canisters would ever hold anything more than dust. 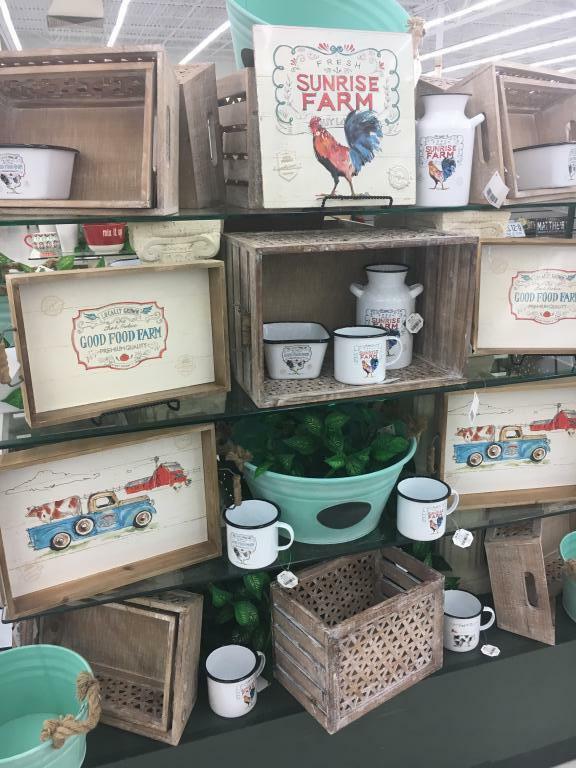 But it occurred to me that this was also more than just décor—the farm-themed merchandise functioned as symbols of red state America. 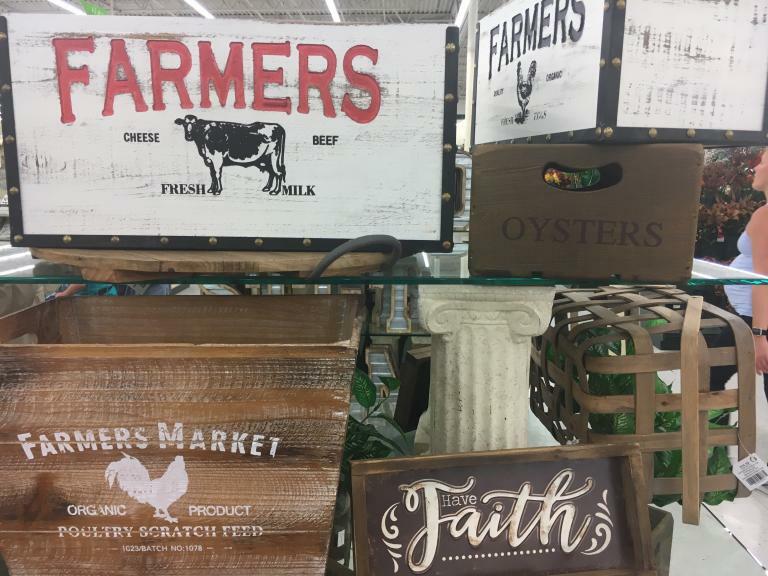 You might live in suburbia, but a fake farm crate or a painting of a rooster could declare your affinity with small-town, country values. I then sent my girls off on their own search while I continued to explore the gender dynamics of the store. If distinct gender roles are central to evangelical identity (a theme of my current book project on evangelical masculinity), this commitment is reflected in nearly every aisle. 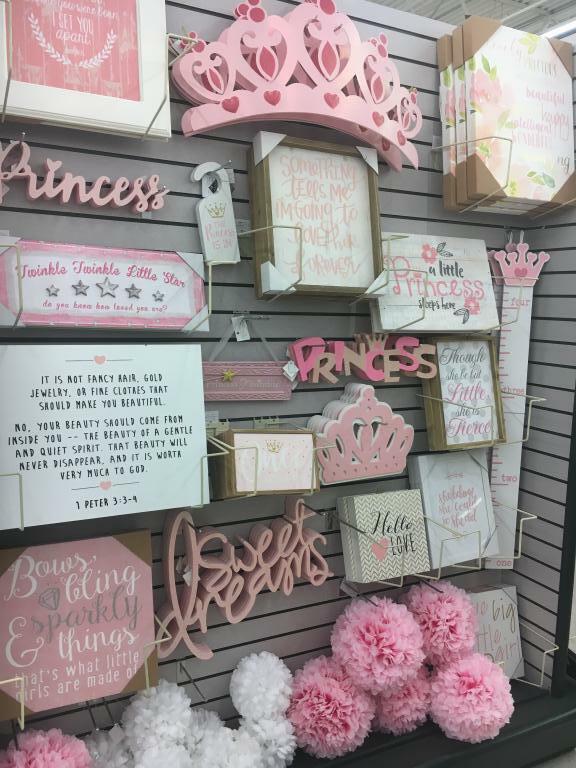 Setting aside craft supplies (which are consumed almost exclusively by women, if my observations are correct), a large portion of the products in Hobby Lobby are explicitly gendered. Second, women needed to be spiritually uplifted on a daily basis, because they were likely to be hot messes. Messages like “All I need today is a little bit of coffee and a whole lot of Jesus,” “messy bun and getting stuff done,” “coffee, mascara, dry shampoo, hustle,” and “All I need are lattes & Lipstick,” abounded. Christian women, it seems, are frazzled, exhausted, yet told to make the best of it while working to keep that sparkle—a little lipstick and mascara, a large dose of caffeine, and a sparkly tumbler ought to do the trick. 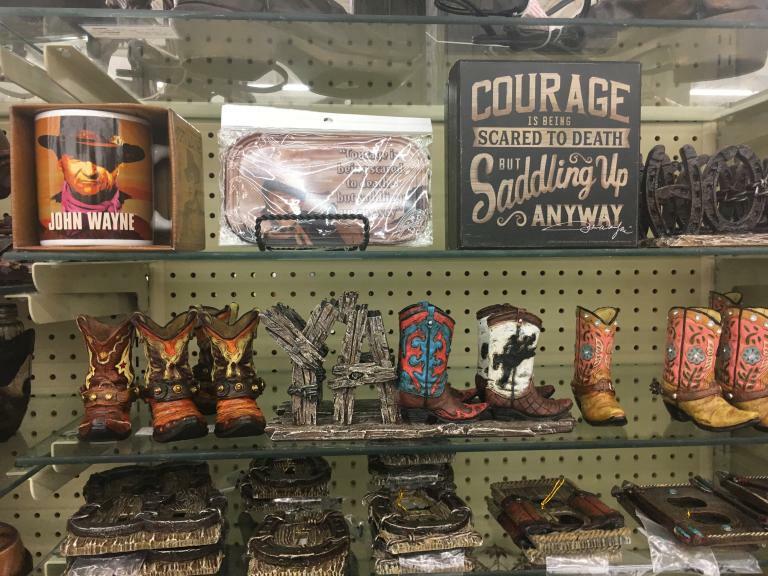 At this point I couldn’t help but wonder—did Hobby Lobby have a men’s section? If so, what sorts of messages might be gleaned when it came to Christian masculinity? 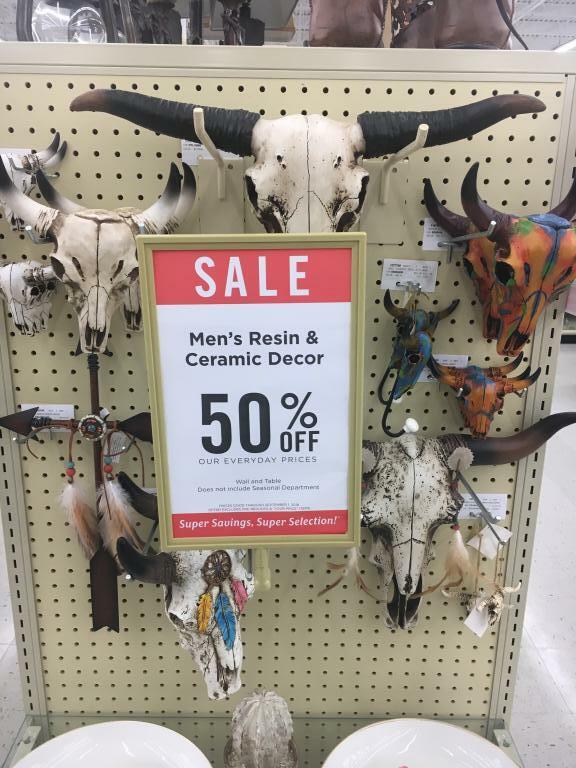 My first clue that I had found the men’s section was a sale sign: “50% off Men’s Resin and Ceramic Décor”—advertising a collection of fake Texas longhorn skulls and Native American-themed crosses made out of fake arrows and feathers. 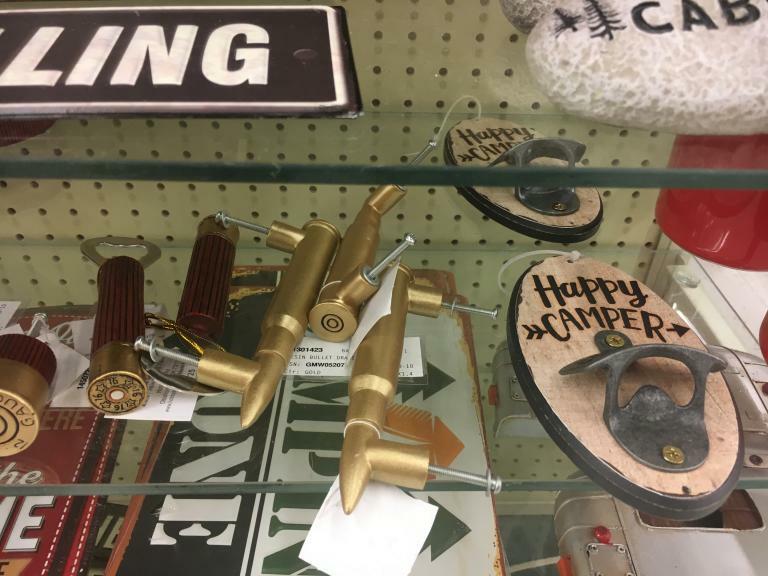 Looking further, I discovered bullet-shaped drawer pulls, a “bolt action” grilling spatula shaped like a shotgun, and a beer (or root beer?) bottle opener. I also stumbled upon a shelf of John Wayne memorabilia and ceramic cowboy boots. Turning the corner, I encountered an extensive collection of rugged American-flag-themed products, including plaques celebrating the Army and Marines, a large picture with the words “One nation under God,” a plaque celebrating the 2nd Amendment, and a rustic flag plaque boldly declaring: “I stand for the National Anthem.” Christian masuclinity, it seems, entails a fairly large dose of gun-toting bravado, nostalgic imperial conquest, and flag-waving Christian nationalism. Although I had no trouble identifying the men’s section by its merchandise, I did not encounter a single man in that entire section of the store. (There were a few men in other areas, often accompanying what appeared to be wives or girlfriends, but none ventured into the “men’s section.” I also conducted a quick, unscientific demographic survey, and at 11am on a Saturday morning every customer in the store appeared to be white). It is an identity that is both religious and political. 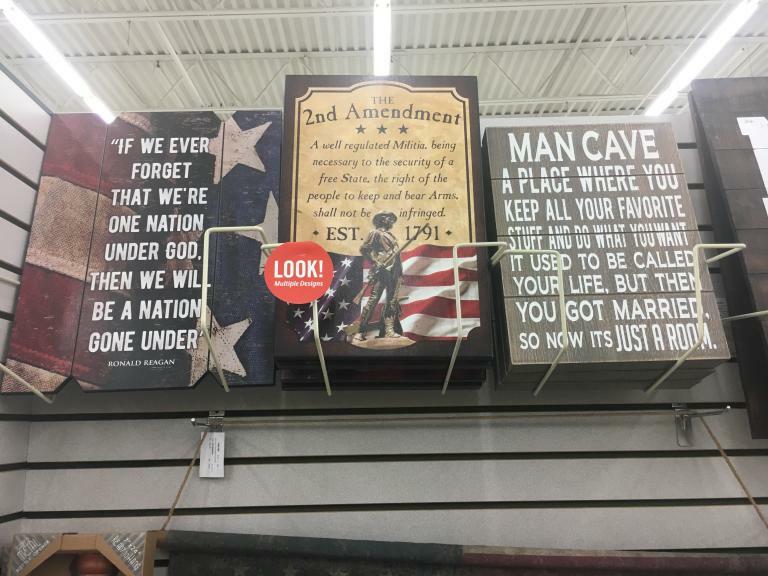 Although any given product might be purchased with a variety of motives or intentions, taken together the material artifacts at Hobby Lobby reflect a compelling and coherent worldview—one infused with race, gender, class, and political assumptions. In the case of Hobby Lobby, it is an identity that is embraced (and sometimes resisted) first and foremost by evangelical women—including many, I would presume, who do not consider themselves particularly political. 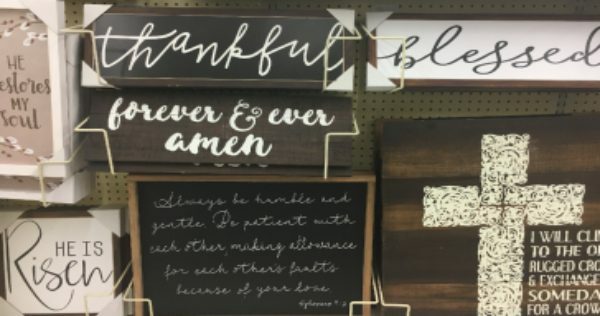 While wandering through the aisles at Hobby Lobby, it occurred to me that conservative evangelical businesses seem to have cornered the market on Christian merchandise. 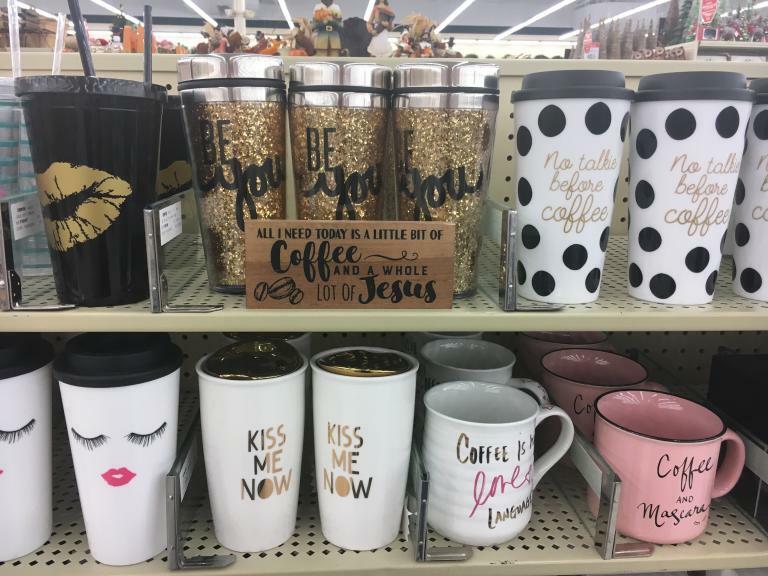 There are reasons for this internal to conservative evangelicalism, but I think there are ways in which businesses like Hobby Lobby have filled a market niche vacated through the gradual “secularization” of other businesses. Although I write as a scholarly critic, and although I may be critical of a larger system in which this Christian consumption plays a part, I do think there is a place for the consumption of religious products. I’m not partial to words on walls, but if I did like words on walls, I imagine I might like a Bible verse or a spiritually-themed inspirational message. I buy children’s Bibles for my own kids. These products may be bought on their own terms, but they are generally not sold that way—in stores like Hobby Lobby, they are components of a larger, cohesive worldview, religious and political. In this way, it seems to me that the availability of Christian-themed merchandise from conservative evangelical marketplaces contributes to the association of Christianity with conservatism, while also reinforcing conservatives’ sense of cultural isolation and beleaguerment. (Perhaps a remedy to this would be more, rather than less religious merchandise in “secular” stores—extending to a diversity of faith traditions). Scholars and journalists have identified “Fox Evangelicalism,” and have wrestled with the white evangelical embrace of Donald Trump. Hobby Lobby Evangelicalism is another, overlapping piece of this puzzle. In an age of declining theological literacy and denominational (or nondenominational) loyalty, it makes sense to look elsewhere for markers of religious identity. 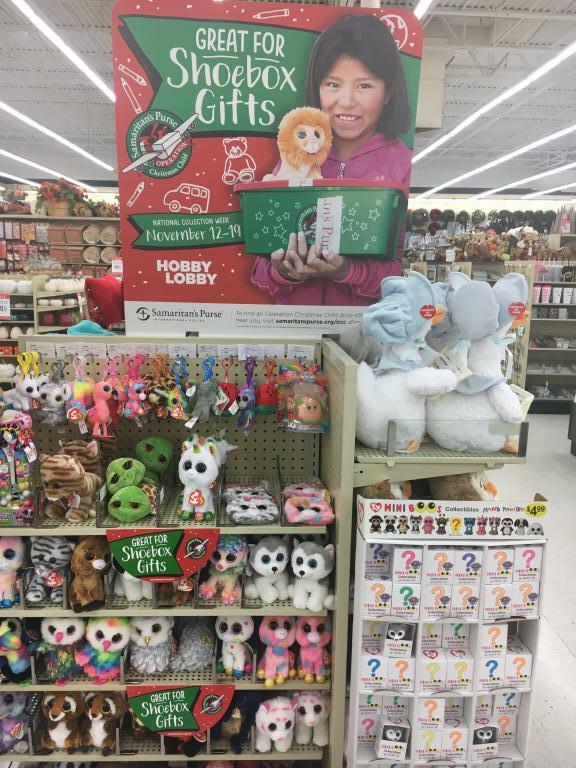 A good place to start may be your local Hobby Lobby. By now you’re probably wondering if we succeeded in our original task–the procurement of a glass bottle. 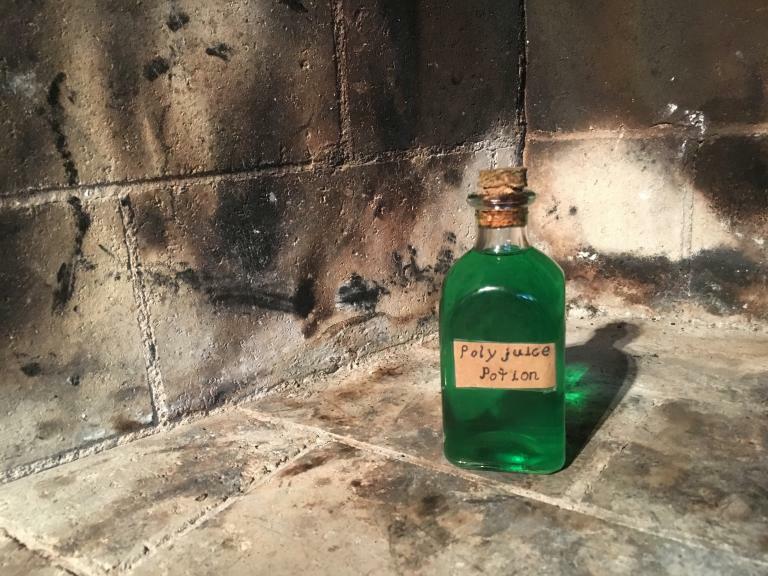 We did indeed find a container perfectly suited for homemade potions. But as my daughter astutely observed as we were leaving the store, there was not a shred of actual Harry Potter merchandise in sight.